Hello summer stains, oh you know who you are. Grass stains, mud stains, BBQ stains and what I can only call mystery stain! 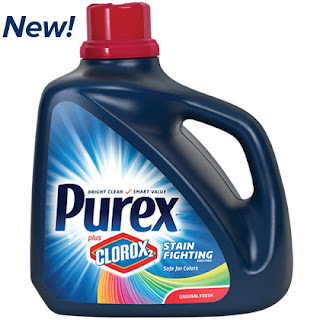 For detergent 3 I need something strong and for me that is Purex. It has always been my go to detergent and thanks to the all new Purex Plus Clorox it now has even more stain fighting power! Now being the clothing lover that I am, I so forgot to take a before photo. But let me just explain a bit what happened. My little guy had a soccer game (Not for a team, we had our old uniform and we were going to play with some buddies) the shorts of his uniform are white..... It is April so I am sure you know with all the rain there is MUD everywhere. And he is, well, he is a boy. You get where I am going? The uniform was covered in mud. After the game we rushed home and I got to work banging the mud off his kleets, shaking it out of his clothing and then rushing it to the washing machine. That is when Purex plus Clorox stepped in and saved the day. You would never be able to tell where that dread mud was!